[VIDEO] Does This Building Blocks Family Fall Apart over the 2015 Mazda CX-5? Automobiles endure incredibly stringent tests before they’re released onto the market–especially those intense, high-speed courses which evaluate performance. While most of these tests are performed by human drivers monitored by computers, Mazda came up with a new way to check the 2015 CX-5’s stability: staging a high-intensity obstacle course on an airport field. 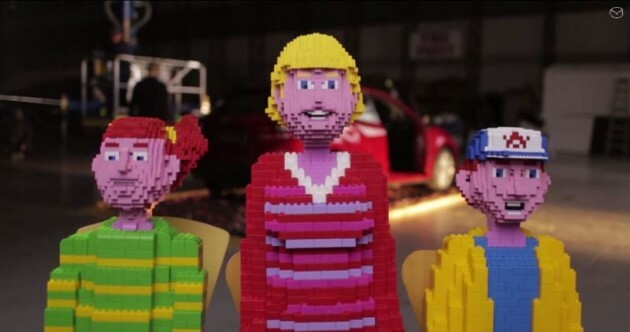 Three life-size people constructed of Mega Bloks (a competitor of Lego, which also appeared in the 2003 commercial for the Honda Element) are preparing to take a wild ride in the 2015 Mazda CX-5. A mother, son, and daughter all are carried into the SUV and secured with seat belts. Footage of the performance was captured using stationary cameras and remote-controlled drones. The maneuvers used include sudden stops, tight spins, swerving around cones, and launching into reverse. In the end, little damage was done to the building blocks family–apart from a couple pieces of hair falling off (honestly, our hair would be falling out too if we were riding along). In frustration, the driver pulls up to the finish line, throws the CX-5 in park, and storms off. See the stability of the compact CX-5 and its SKYACTIV-Chassis in the commercial below. It’ll make your head spin!